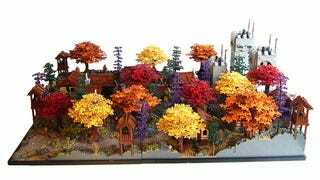 It’s not the 80,000 pieces and the roughly 17 days of build time that makes Blufiji’s fantasy LEGO diorama awesome, but the beautiful autumn scenery. Everything just flows with the trees and colors. The Reach..Vanguard of the Southern Rakath Range and surface capital of the Goblin Empire. It is also home to several different species, including Humans, Dwarves, Kozar, Goblin, and Orc, all living peacefully (Nocturnian peacefully that is) under the protection of the Goblin Empire. The town itself sits in a long, narrow valley, bordered by steep cliffs on one side, and the Vanishing River on another, named because it disappears and reappears in a series of sinks and springs as it makes it’s way down to the ocean. The Fortress of the Reach sits at the far top of the valley, and consists of a series of courtyards and towers, design to make siege difficult. It is also connected to a vast cavern system, where reinforcements can be summoned if need be. The town itself sits within the Twilight Forest, aptly named due to its permanent assortment of warm colored trees, reminding those who travel and dwell within it of the sunsets. Here are some highlights from different angles so we can survey the castle itself and the surrounding buildings. Check out Eurobricks Forums and the builder’s Flickr page for more.